Baby boomers will be the last generation with substantial access to traditional pensions. Gen-X is the first generation to heavily rely on defined-contribution accounts. Only 12 percent of Gen-Xers feel they are saving enough, TCRS’ survey found. Behind this financial insecurity is a $97,000 account balance for the typical Gen-X worker, according to an analysis by the Center for Retirement Research (CRR) of combined 401(k) and IRA balances in the latest Federal Reserve’s Survey of Consumer Finances. 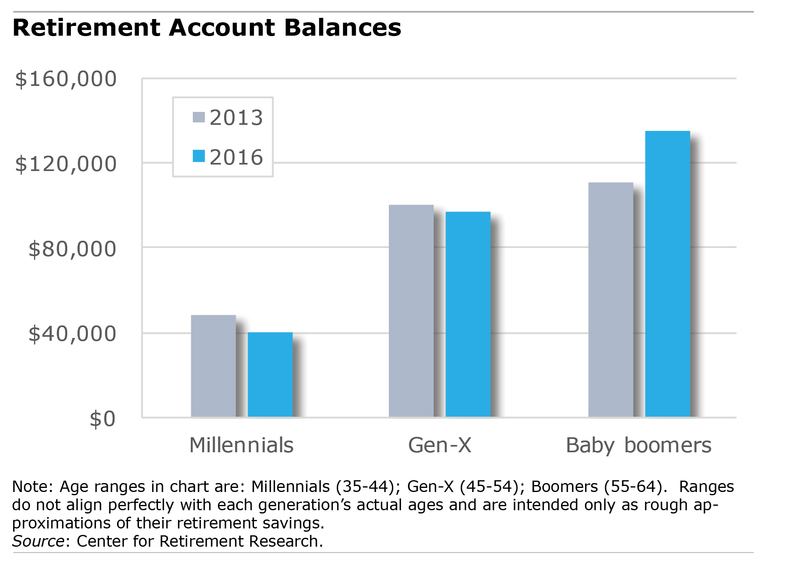 Gen-X retirement balances have shrunk $3,000 since 2013 – contrast that to baby boomers, whose balances have risen with the stock market since then. One potential explanation of Gen-X’s lost ground is a neglect of their investments at a crucial point in their working lives. Forty percent said in the TCRS survey findings, “I prefer not to think about or concern myself with retirement investing until I get closer to my retirement date.” Ideally, 401(k) investments should be set and forgotten, but it’s advisable to check in on the fees charged by your mutual funds, to rebalance the portfolio periodically, or to consider a newly introduced target date fund, which would automatically adjust the investment risk for the worker as he ages. But it’s also reasonable to speculate that financial pressures are bearing down on them from raising a family, sending kids to college, and sometimes dealing with aging parents. Gen-Xers are just as likely to care for an adult – their parents – as are aging boomers, who are usually their spouse’s first choice of a caregiver. Evidence of Gen-Xers’ financial distress: 30 percent said they have borrowed or taken out early withdrawals from their retirement plans, TCRS found. This is slightly higher than baby boomers and considerably more than millennials, who have saved $40,000 so far. Gen-X seems realistic about the upshot of their decisions: more than half said they either won’t retire until after 65 or do not plan to retire at all. Still, many of them view retirement as their top financial priority. Gen-Xers’ and millennials’ retirement preparedness could use some improvement. But the important point is, now is the time. “Gen-X seems realistic about the upshot of their decisions: more than half said they either won’t retire until after 65 or do not plan to retire at all.” Realistic in the sense that they appreciate that it may be difficult to retire comfortably before 65. In the sense that they honestly believe they’ll be able to work after 65 – let alone working until death? Maybe not so much.